Picture this: you’re in a shop and you’re not sure what you want so you approach an employee for assistance. They are very helpful and you walk out thinking, I received great service, I’m definitely going back there. If you own a shop this is how you want all of your customers to feel. In the next few weeks you may experience more business and here are some tips on how you can ensure that your potential new customers keep coming back. Ensure all gaps on the shelves are filled, the big supermarkets and metro shops do not have gaps as it demonstrates that the shop has products, which may fulfill the customers needs. If a customer is aggressive listen, evaluate and take action in a calm manner. If a customer is purchasing a product, why not ask what they need the ingredient for and offer some tips and additional products they may purchase (if it’s a food shop)! Treat customers and put on some offers that may entice people to your shop. Ensure stock is rotated correctly with the oldest date at the back with the newest date at the front, ensure load lines are not exceeded as it can be unsafe. Opening and closing as you know is important, opening time are key for customers. Being consistent and reliable means that you will get consistent and reliable custom. Close to closing time, politely inform the customers that you’re closing. A sign of opening and closing times should be clear and followed to gain and retain good business. If a customer is on the phone, face to face or email, they should be valued as they may just be enquiring about a product. If the first impression is great then you will be hearing and possibly seeing them again. 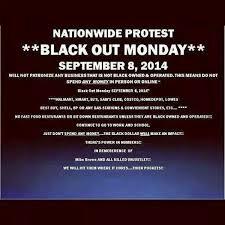 As a black consumer, I hope you do well on Blackout Monday and that your business is a sustained success. This entry was posted in Uncategorized and tagged financial inclusion, Group economics, powernomics, social inclusion on August 29, 2014 by Upliftment Information. Our future is important, we need to buy at least 60% of our products from our own people. Otherwise, we will continue to have the lowest employment rate and very little self-empowerment. We won’t have any money to celebrate our culture and history unless someone else approves it first outside of our race. Go to black owned cash and carry shops or a local black owned shop for fruit and vegetables. Another great source of Fruit and Vegetables can be your local or regional Black Market stall. You may be able to get deals on purchasing in bulk for you/and your family for this period of time. These can be purchased from black hair salons or the internet. If you live near a black area or market, there may be stalls with black people who sell our own foods. These can be paid for through a post office, or company as normal. It’s a necessity for work and school attendance, if possible use your own car, car share, cycle, use public transport, or Walk. Entertainment and news is how we find out about things in the world. The world you live in can be different to everyone else’s, how about the world your ancestors created for you or our descendants. In this time the world can seem different when the information is provided by those who do not live your life. There are some media sources such as newspapers, films and news, which can keep you informed and empowered to be positive. Seek out these items through local libraries or the internet. The clothes we buy we usually need, how about if we buy from our own people who have an idea as to the type of clothes we want. If you require specific fittings you can go to a tailors. You can gain a good feeling when you buy from someone who’s practices and cultures are the same or similar to yourself. This entry was posted in Uncategorized and tagged financial inclusion, Group economics, powernomics, regeneration, social inclusion on August 29, 2014 by Upliftment Information. its been a while since I spoke, I have added a couple of new pages, these are under the educational tab on the menu and they are homeschooling and Financial Education. These two pages are important in relation to social upliftment, social inclusion and economic development. As a black person, I feel that the black community in the world, who are Diasporas, do not make the most of the financial capital which we posses. We generally use our social capital very well, but when it comes to retaining the money in our communities we tend to spend it elsewhere rather than supporting our own communities. Some will say what I am saying is racist, though I deny this as I am using my regeneration and economic development experience and knowledge. Over the years I have gathered that in order for a community to develop there must be a bottom up effort from the members of that community to really tackle the heart of the communities problems. My view is that there is a need for more small and medium black owned businesses in order for there to be some sustainable success within our communities. It’s impossible to live in another country and not contribute towards it. The aim I envisage would be a 70:30 ratio in buying from your own community and buying outside, with the 70% of purchases being bought inside your community as a start, as we know our consumer needs, whilst the mainstream is not clear on this. I have added the home school information as I am more and more convinced that black people cannot be educated successfully to our needs in the mainstream system. For example, I feel had I have stayed at home I would have remained a top student instead of falling down the order and only picking myself up at the age of 16 when I realised I needed to be socially mobile. The need for home school and financial education fall hand in hand as black parents may run a business, and be able to pass financial information to their children on how to run a business, learn about life, be more confident with literacy, numeracy and science, and learn how to make sound financial investments, which will enable them to make a real impact in relation to the development of our own communities. Besides a child only needs to learn for a few hours 1:1 as opposed to several hours in a class of 30 or 40 children, as children in private schools tend to have a greater quality of education if they have more time 1:1 with the teacher. I hope you find this information useful and I’ll be speaking again very soon. This entry was posted in Community Development, Group economics, Social inclusion, Social upliftment and tagged black empowerment, Black Nationalism, black people, Financial Eduacation, financial inclusion, Group economics, Home Schooling, powernomics, social inclusion, social upliftment on August 27, 2014 by Upliftment Information.